Formerly a Television newsreader Liam also hosts a number of national radio programs. 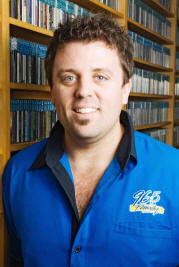 Daily he is the host of The Family Show, a breakfast radio show that is networked to numerous cities in Australia, and weekends as the host of Australia’s Hot 25 countdown, heard nationally on more than 400 radio stations across Australia. 1. How has 96five evolved over the last few years? 2. Has 96five made any changes due to economic situation, been affected in any way? 3. How does 96five connect locally with markets? We are the radio station in Australia with the title of doing the most outside live broadcasts than any other. Its important to us to be out live in front of potential listeners. Each week live from a local school meeting people where their at. 4. What criteria do you require for a song to be played on 96five? It’s a tough criteria and done through a music panel, not just one person. A song must make it on the charts before we play it. We don’t break new music. Our format is blended with a 50/50 split of Christian and mainstream, all our songs need to be big hits to help with the unfamiliar factor some of our tunes have. A song is lyrically checked, and the film clip also reviewed, and we do a background check on the artist to see if they fit our on air profile. We have done the massive car giveaways before, and as fun as that was, we find the smaller prize giveaway more successful. More prizes, more winners. We try and create an experience for families with our prizes. The best prize we can give is time, so we often have events, like filling an entire cinema, skating rings or theme park of keen listeners and there families. Its all about relationships, don’t just send an email or a cd in the mail ,make and effort to get to know the PD, or MD, sell them your heart and story, they will often buy into a story or quest rather than a well written , often unread press release. Breaking the stereotype that Christians are losers and Christian radio is uncool. To connect with people, all stations do time, temp and a music hook. Get one on one with people, where there at and connect with what there doing that day, be a friend but not a cheesy fake friend, make an impact and connect and effect. I’d like to think we are, 96five lives by the motto “we have nothing to lose when it comes to programming and promotions, if it fits our brand, we’ll try it. We simulcast the national TV news for a listeners stuck in traffic driving home at night for ½ and hour, We’re about to run non stop Christmas programming with 24 hour Christmas tunes in the 12 day lead up to Christmas. Running the risk of becoming extinct if it doesn’t connect, reach out to the secular market and impact.